What a day, we are told that Spain is in the grip of a heat wave (Scorchio! ), what a relief we thought this was normal. It is supposed to break on Wednesday. We have been walking down the valley of the Aragon river travelling west towards Pamplona and we are half way down the south side of the Embalse de Yesa which is a large reservoir built during Franco’s time, the village of Ruesta does not exist as villagers were forcibly relocated and the houses partly demolished, with the resurgence of the Camino and the absence of accommodation along the Embalse it has become a pilgrimage stopping place with a full Hostel providing overnight accommodation and meals of good quality and quantity. 30€ each for the night and two main meals, with the heat we shall leave well before breakfast tomorrow. After lunch 1400- 1500 it is siesta for about 4 hours, it would be stupid to be out walking in this at present. We left the Albergue Peligrino in Bergun at 0615 this morning and had about 3 hours of great comfortable walking as dawn broke over the now distant Pyrenees, some of this was through “Badlands” rain eroded shale with fine gravel and dust, partly on cart tracks and partly on a small minor road with very little traffic, we paused briefly in Arteida another hill town (that we had to ascend to) at 0900 in vain hope of coffee and then were soon on our way with the advice of two locals we found the Camino again. After a kilometre or so it left the road and dived into a green lane (they don’t have them in Spain), this is probably the only one on the Camino but was very welcome as the shade speeded our progress and improved comfort. The ruins are sad and quietly impressive as many like them are. Some are wired and cordoned off and a few are repaired into the Alberge, we are told there are plans to repair them all but it will probably not happen and they will remain a great stopover on the Aragonese Way. Over lunch, discussion was made about 2 Polish pilgrims who had been seen on and off over the previous few days. It is suspected that they are walking small sections of the Camino and then using taxis to go the rest of the way. They left Ruesta at about 1pm and there isn’t supposed to be a proper road out of the village so their plans may come to nought. Maybe we will find out tomorrow their fate. After a walk round Jaca we had an evening meal with George our friendly car salesman from Valencia tasting some local red wines by the glass. The hostel closes at 10pm and we just made it back in time, George hung around down stairs with a cigar and let a few stragglers in. It was an interesting night, there had been a stag party going on in the bar we ate in and whether this had spread through the town or whether there really was a full scale riot going on outside, or if this was just normal Saturday night in Jaca, but the noise did not die down until about 0430. An hour later we were getting up to walk and avoid the heat. We hit the street at 0545 in the dark and set off following the brass scallop shells in the centre of the street, after an awkward bit where they seemed to vanish we picked up the familiar yellow arrows with red and white waymarks. The Camino, even the less frequented Aragonese part seems to be much better marked than any of the GRs in France. By now it was light enough to see on the rough cart track we were on and the way continued down the Canal de Berdun, canal in this context being simply Spanish for a valley not an artificial waterway. We had breakfast at some picnic tables and pressed on rapidly to get some miles done before the heat really started. A brief stop for a coffee and we were in Puenta de Reina de Jaca (not the bigger town further down the route of the similar name), having passed through a patch looking like someone’s art project with round stones piled randomly on top of each other in a patch of forest scrub. The route supposedly now followed a main road to Berdun but left it as it wound further north crossing fields and dry river valleys to reach Berdun a small town on a hill dominating its surrounding area. By now the day had warmed up, we had covered 31km and it was 1230h. We struggled sweating up the hill to look for an inn or the pilgrim hostel not entirely sure what awaited us. In Berdun we found a small bar and restaurant down a little street and bought a beer. The landlady told us that there wasn’t a full menu as it was Sunday so we bought an omelette each and then went for a circuit of the town looking for accommodation. Having found none, we returned to the bar to ask if there was any accommodation in the town to be told that it was actually available via this bar! So we are now ensconced in pilgrim accommodation a few yards down the street in a old house where the bar stores their excess stock. It seems to be just the job! Canfranc Estacionnes to Jaca (pronounced hacker). This morning we said goodbye to Ralph our latest visiting pilgrim, and P.I.S.S. (Pilgrims International Support Services), many, many thanks Karl and Claire in making it so easy for us to shed the load of gear we no longer need now we are on the Camino proper. Have a good trip home. Estacionnes in the name refers to the huge (platform is 241 metres long!) barely used (now just 2 carriage trains from Jaca) international railway station being refurbished (? Why) , that used to be the point at which French trains would stop and Spainish trains takeover at the entrance to the old Somport railway tunnel, although the road tunnel is in constant use the railway tunnel is now not used at all. We met in Canfranc with George a Spanish car salesman from Valencia , he speaks English that is improving a lot faster than our meagre Spanish, we have met him again walking down and in Jaca while waiting for the hostel to open at 1500h, according to George who has done the Camino four times it depends on whether they are official or private if official they should be open all day. As we descended the valley the day lengthened and the temperatures rose we reached Jaca about 1230 and agree it is too seriously hot for much walking in the afternoons. We passed over the Puerto de Pelegrino a very ancient bridge and across a set of stepping stones about 3 feet high, designed to cross the river at that wide shallow place when in spate from snow melt, unfortunately one was broken, but the summer level is such that jumping from rock to rock is a perfectly dry crossing. The contrast between the modern road running down the valley with its engineered bridges, and the stony track with multiple relics of past travel is huge. We hope to make an earlier start tomorrow and do a good six hours walking before stopping to find accommodation for the night. Quite a big day, some slight rain in the morning at about 0500 but the clouds were below us when we emerged from the refuge after breakfast. We climbed steeply up to the Col de Peyreget. On the way up we saw several chamois know locally as Izards. They were remarkably unconcerned probably knowing full well they could move a lot faster over the hillside than us. Almost at the col the sun started to come out from behind the Massif of the Balaitous and illuminated the clouds below. As we descended the other side the clouds there rose to meet us, the temperature dropped sharply and Tony’s GPS was employed to ensure that we were on the correct route down to the valley that would lead us up to the Col de Moines and our final crossing into Spain. We went down in the mist through a steep valley with many purple iris in bloom and the stalks of the just finished blooms of Asphodel. We emerged from the mist just above a cabin in which in the summer live a family with pigs, cows and sheep making cheese some of which we bought for lunch. Another steep ascent and further views of clouds with Pyrenean peaks poking through them to a small lake and the final rise to the col and the Spanish border. After descending into an unused ski resort we traversed around the road to Col du Somport where we met the pilgrim support party of Karl, Claire, Alex and Jonathon. There is nothing at Col du Somport and we were grateful for lunch with the shared sheep’s cheese and beer before walking down to Canfranc, with Karl and Jonathon where they had already booked us and them into a pleasant B&B. Washing, charging of batteries and general regrouping with things to send home or not facing last decisions. 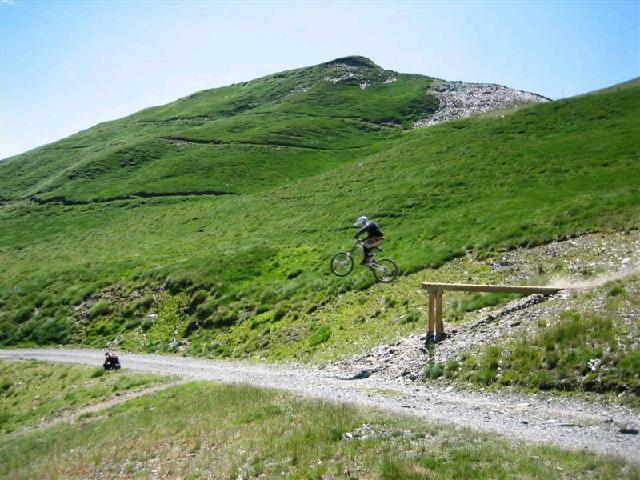 We started with a descent to 1392m into the valley leading to Col de Pourtalet. We surprised ourselves by a time of a bit over 4 hours for 8 miles and 800m descent and 600m ascent. The view of the back of Pic de Midi d'Ossau revealed it to be a 500 meter scree slope and during the 3 hrs watching no one was on it so we have decided not to do the pic but press on tomorrow to Col de Somport and meet up with Karl and family in Spain. The view back towards Balaitous and Refuge d'Arremoulit is fantastic and the little refuge d'Arremoulit (29 beds plus a big party tent) is not only in a suberb position but also the guardienne is an excellent cook, feeding 46 people on soup, pork and prunes with rice, cheese, and a sweet all produced in a tiny kitchen and some very large pressure cookers. An excellent evening was had at Respumoso. This refuge was in Spain and a cut above the refuges we have stayed in in France. There were hot showers (if you let the water run for long enough!) as well as 14 person dormitories all en suite. Tony was stupid enough to leave the door unlocked and was interupted by a french woman as he stepped from the shower. This caused her and her nine friends much amusement! For anyone who hasn't stopped in a mountain refuge, then they are an interesting experience. They are located some hours walk from civilization and are refreshed by either a mule of a helicopter bringing up stores from the nearest village. The initial huts were built by mountaineering clubs (eg caf, club alpine francaise) over 100 years ago and added to in the intervening period. They tend to be manned over the summer months by a resident guardian who cooks meals for those who are staying there. You sleep in dormitories from either just a few bunks to the 100 in a single room on 3 levels at a refuge in Corsica we once visited. After breakfast this morning we left the refuge and followed a variante of the HRP (pyrenean high route) up to Col du Palas. On the way, Ralph found a nice cold mountain lake and decided that a spot of skinny dipping was in order. Photographic evidence to follow! 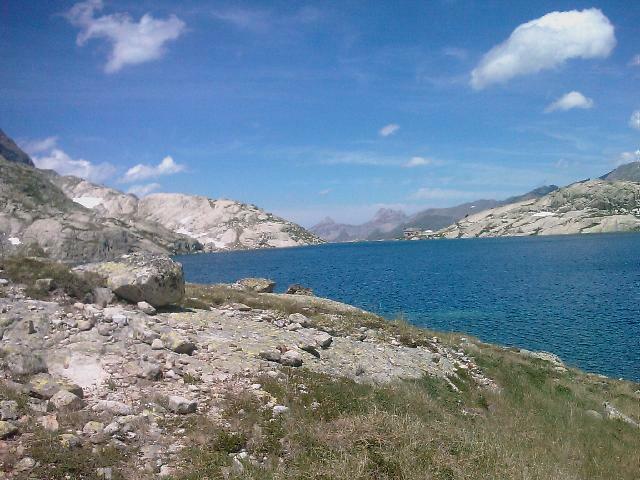 After an interesting scramble up to the col we descended down to the refuge situated by the lake. The night was enjoyed by all (especially Jonathan for whom is was a big adventure). 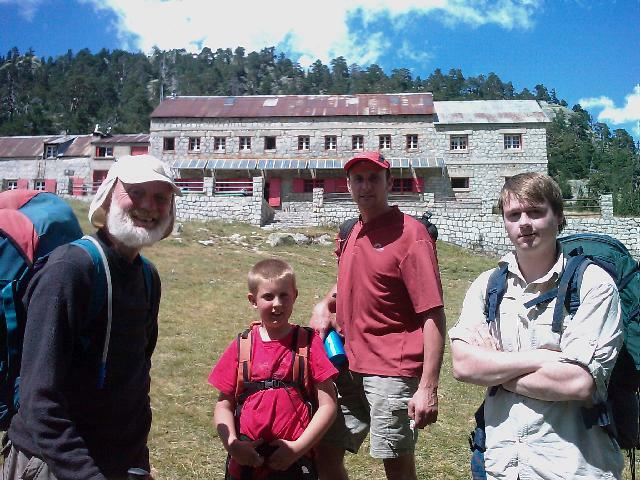 After breakfast Karl & Jonathan left us to return to Pont d'espagne leaving us and Ralph to ascend to Col de la Fache. Ascent up an excellent path over streams and boulder and snow fields to the Col de la Fache very windy 2664m first time we really needed extra layers. Several groups were completing the ascent of Grande Fache 3005metres but with minimal gear we thought better of it. The descent was significantly steeper and more awkward and Ralph was grateful for Betsy's walking pole and has assumed some joint responsibility for its return to owner. Further down a marmot was much more willing to be photographed than those on ascent while playing hide & seek with Tony. We left Cauterets by bus this morning to go to Pont d'Espagne (not breaking any of our self imposed rules as we walked here and back earlier on in the week). We are accompanied by Ralph, Karl and Jonathan. Claire & Alex have been left the un-enviable task of drying and taking down all the hike tents. Our kit is much reduced as we have left behind tents and cooking gear due to the fact that we will be stopping in mountain huts for the next 5 nights. This allows us to use 45 litre rucksacks rather than the 65 litre ones we have been using and reduce the weight carried from 18kg to about 10kg (only a guess as we have no means of weighing them). Ref Wallon is at 1865 meters and has beds for 120 people. Meals are provided, as is breakfast and a picnic, but at a price, so lots of counting of euros to find out what our budget is for the next 5 days as we suspect that we haven't really got enough cash. A day for Karl’s boys to see the mountain tops and experience a cable car and ski lift, weather fine and a great picnic up in the Cirque de Lys. We also had our first sight of marmottes having heard their characteristic whistle in the valley earlier in the morning. We have now booked via Betsy (thank you) all the huts we need to cross the Pyrenees on the Haute Route starting tomorrow. Karl and his older boy (Jonathan) will accompany us on the first day and then back the next, they will then meet us five days later to pick up Ralph. Thus earning themselves honorary pilgrim status and doing us the enormous favour of taking home to England our tents and cooking gear that we no longer require on the Camino proper. The next guest should be Ray Majer in about 3 weeks time,. Happy Birthday Tim aka Buster Merryfield. After the arrival of Ralph, Karl and family the weather rapidly deteriorated leading our Scouting heroes to erect the basha from a tarpaulin which had been purchased earlier. A glass of real British beer was very welcome at this stage in that curiously lukewarm state so beloved of all British beer drinkers. Cheers and thanks Karl. We awoke in the morning to find the valley shrouded in a moist low cloud and after some breakfast a walk into town where a small rucksack for Alex (Karl’s younger boy) was purchased, after collecting some pizzas for lunch we returned to the campsite. After lunch Tim was presented with a birthday cake purchased without his knowledge in the town, it was eaten completely immediately as it turned out to have ice cream inside. Ah! That’s what the shop lady was on about with le frigo!! All in all a very satisfactory birthday thank you all.